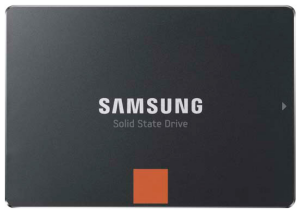 Today, CDRLabs brings you a review of Samsung's new SSD 840 Pro Series solid state drive. Designed and built completely in-house, the SSD 840 Pro is powered by Samsung's own triple-core MDX controller and features a SATA 6GB/s interface, specially-engineered wear-leveling and garbage collection algorithms and AES 256-bit full disk encryption. The drive also packs up to 512MB of cache and is equipped with Samsung's Toggle DDR2 NAND flash memory to deliver up to 540MB/s read and 520MB/s write speeds. Finally got around to posting some benchmarks with the drive in RAID. But the 4K-speed seems not really better than with one drive. Feeling any difference between Raid and None-Raid? Feel a difference? It's kinda like going 100MPH in a car and then 200MPH in another. You just know you're going really, really fast. I'm not sure what the deal was with the 4K speed being lower with RAID. It may have something to do with the extra latency that RAID adds. You only see this at low queue depths though. Is it only a test or do you use Raid 0 all day? Yeah, during everyday use, the queue depth rarely goes above 3 or 4. Most people will never take advantage of an SSD's maximum random read/write capabilities. It was just a test. I just wanted to see what sort of performance I could get out of two of them. A single SSD is fast enough for me. Ian wrote: A single SSD is fast enough for me. Do you still own 2 M5P? Scour wrote: Do you still own 2 M5P? Yeah, I actually have three at the moment. Two of the original M5P's and an M5Pro Xtreme. I'm using one of the M5P's in my Windows 8 box at work. I was going to put the other in my laptop but picked up a 512GB 840 Pro instead. What CDI shows on your Plextors? I'll have to get back to you on that. Maybe you guys are using different versions of CDI? Might be something with the different chipsets too. I really don't know. Tried the same Version(s) on both.